Battery-powered tools have revolutionized how we all work around the house, yard, and shop. There’s no doubt about that, and there’s no denying the convenience, freedom and power provided by cordless tools. However, most tool manufacturers include a battery and charger with each new tool. Now that sounds like a great idea, but after purchasing several tools, you end up with several batteries and chargers that you paid for, but don’t really need. The WORX 20V Power Share program offers a more sensible—and economical—approach to buying cordless tools. With the 20V Power Share program, you can purchase 20-volt lithium-ion batteries and chargers separately from the tools. For example, you can buy two or three tools, but purchase only one battery and one charger. Then, as your tool collection grows, you can buy additional batteries and chargers—or not. The Power Share program allows you to choose how much to spend on batteries and chargers. 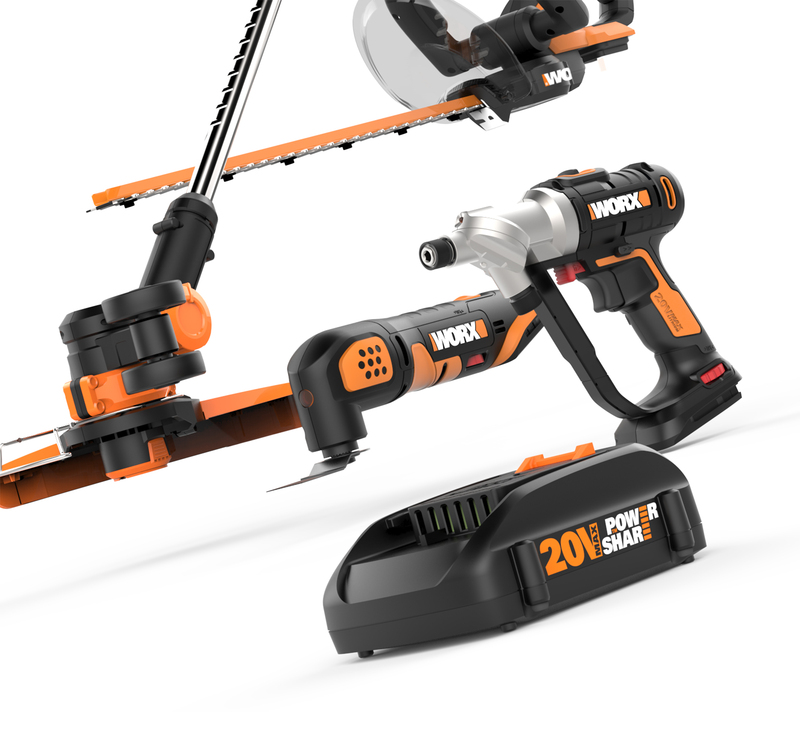 The WORX 20V Power Share lineup currently includes nearly two-dozen cordless tools, including reciprocating saws, chainsaws, leaf blowers, circular saws, string trimmers, drill/drivers, garden shear, power cleaner, impact driver, LED work light, shop blower, hedge trimmer and an oscillating multi-tool. And you can choose from 2-amp-hour or 4-amp-hour batteries, and single or double-port chargers. Now, if you prefer getting a new battery and charger with each tool purchase, that’s fine. WORX also sells tools in complete packages: each tool includes a battery and charger. And with the popularity of its 20-volt Power Share tools, WORX has expanded the program to include a line of 40-volt and 56-volt Power Share tools. For more information, visit: www.worx.com. The WORX 20V Power Share program offers a more sensible—and economical—approach to buying cordless tools for your home and lawn.